For commercial data cabling in Houston, contact Highlights Electrical. Our trained technicians are proficient in data cable installations. 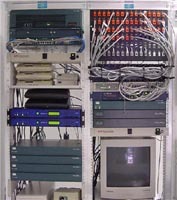 We can design and install complete LAN and WAN systems and provide certified test reports. Highlights Electrical provides high quality data cabling in Houston, IT services and fiber optic design, installation and testing. Our expertise lies in data cabling and fiber optics systems. Constant training and recertification puts our team on the cutting edge of information technology. Call 713-266-6464 for more information.